Hello, Monday is almost over and aren't we all grateful? To start something IS harder than keep doing it. And Monday is the start of the week. But aren't you just happy that you did start it? I'm sure you have this sense of accomplishment and the satisfaction of doing something that you didn't want to do. It makes you feel like a grown-up and all powerful. Also, the fact that now it's time to relax and dive in one more to time to another world via your latest favorite reading... It couldn't get any better than that. Alas, my books have been neglected and I sort of feel guilty. But not tonight! These pictures were taken two weeks ago at Pepenero. I met up with friends and decided to dressed simple. No fuss. However, I love prints, especially floral. 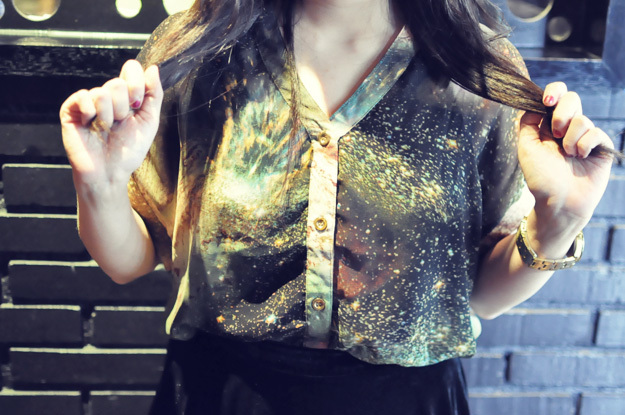 But, galaxy prints have been stealing the limelight in fashion lately. 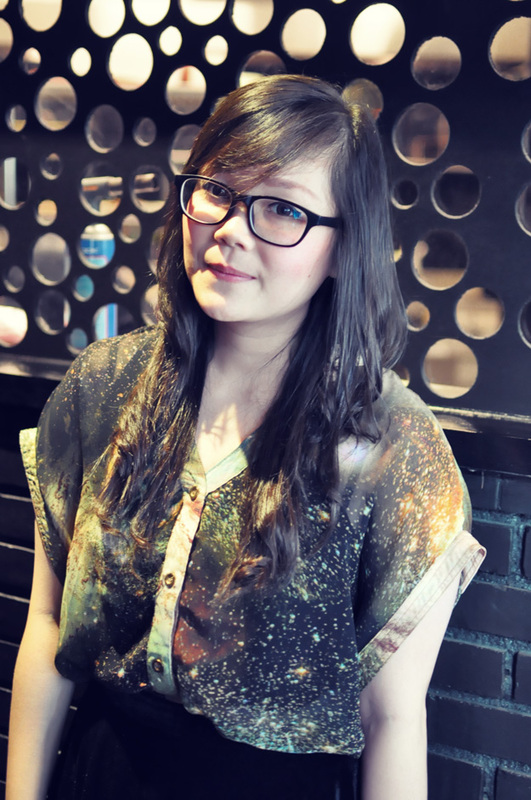 Being someone who is easily impressed, I wore the galaxy printed top I snatched on my latest trip to HongKong. 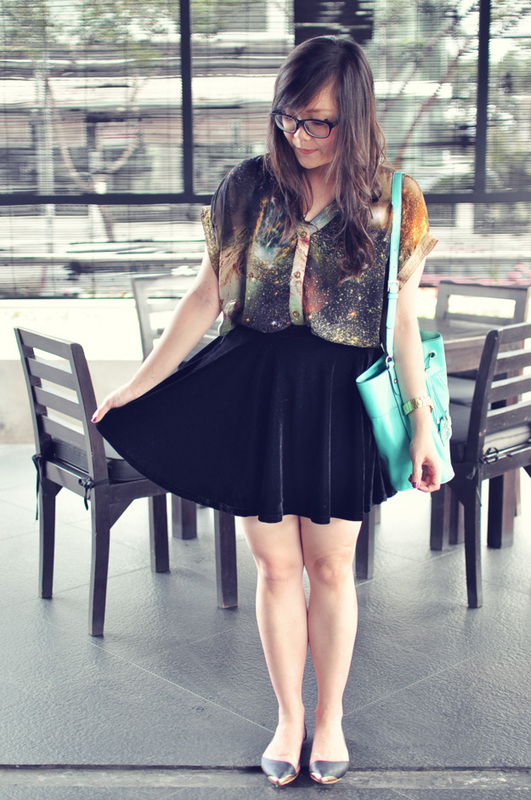 Paired it with a black velvet skirt and a pointy flats to keep the galaxy print the star of the outfit. Hopefully all of you will have a good night sleep! love the galaxy meets velvet ci, I wonder if you mix galaxy with a touch of vintage, as you are pro in vintage look.. would you consider it? Pengen banget liat gimana hasilnya kalo galaxy di mix sama vintage look dan dipake sama ci stev.. hehe... good night for u too! and that pizza loooks delicious! I actually love Mondays. There's something about beginnings that really gets me, you know! 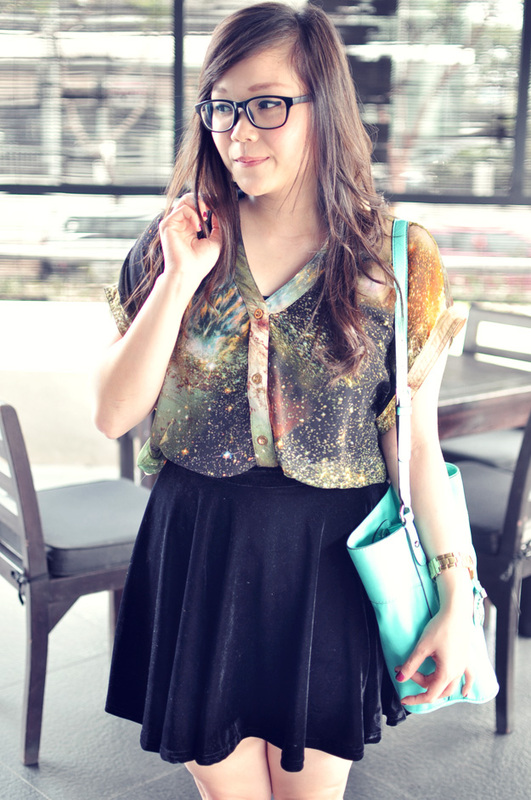 :) LOVE that galaxy top! Reading this post made me feel all hungry. Love the galaxy print too! Amazing outfit!! I love your galaxy shirt and it looks nice with the skirt. (: Great! Really nice look, the blouse is fantastic! Looking lovely - both you and the food ! ^^ Cool blouse.. I love galaxy prints! I have a skirt that looks very similar to your top. Which reminds me that I need to wear it again soon! I really love the velvet skirt you paired with the galaxy top and those pointed flats are adorable too. Such a cute little outfit and an lovely blog! Very cute! If you're serious about an illustration/blog banner exchange, just email me at ohavalanche@gmail.com! I love galaxy prints! Your top looks amazing :) nice fit, and the pairing with the bright bag and velvet skirt was genius! I was gonna say I love your blouse but then I realized I also love your skirt. Turns out I just love everything you're wearing! Love that blouse and how amazing are your photos!